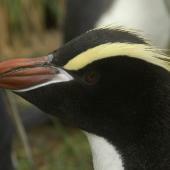 The erect-crested penguin is one of three similar-looking crested penguins endemic to southern New Zealand. 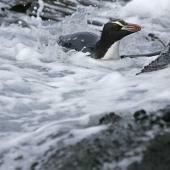 Its main breeding grounds are on the remote Bounty and Antipodes Islands. 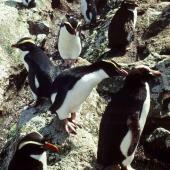 Individual birds are found moulting on the east coast of the South Island most summers. 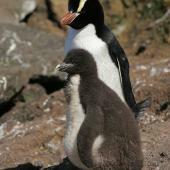 This species has one of the most bizarre breeding systems of any bird, yet the details are poorly known due to its remote and inhospitable breeding locations. 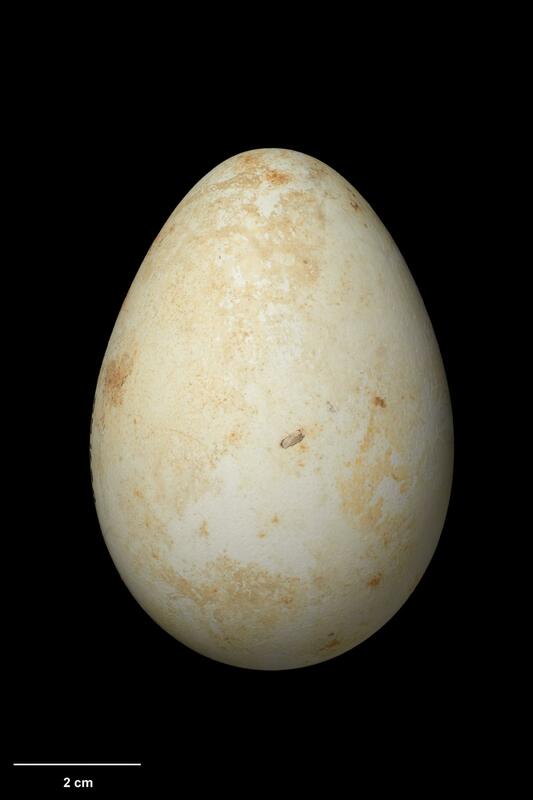 It has the most extreme egg size dimorphism of any bird, with the second egg of the clutch averaging 81% larger than the first egg. 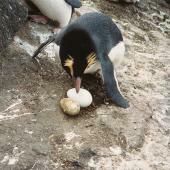 The purpose (if any) of the first egg remains unclear, with nearly all pairs losing the smaller first egg around the time the second egg is laid. Much of this egg loss is deliberate, with incubating birds lifting eggs out of the nest bowl, or pushing them out with their bills. 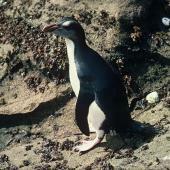 A medium-large crested penguin, about four times the size of the familiar little penguin, and slightly larger than the similar Snares crested penguin. 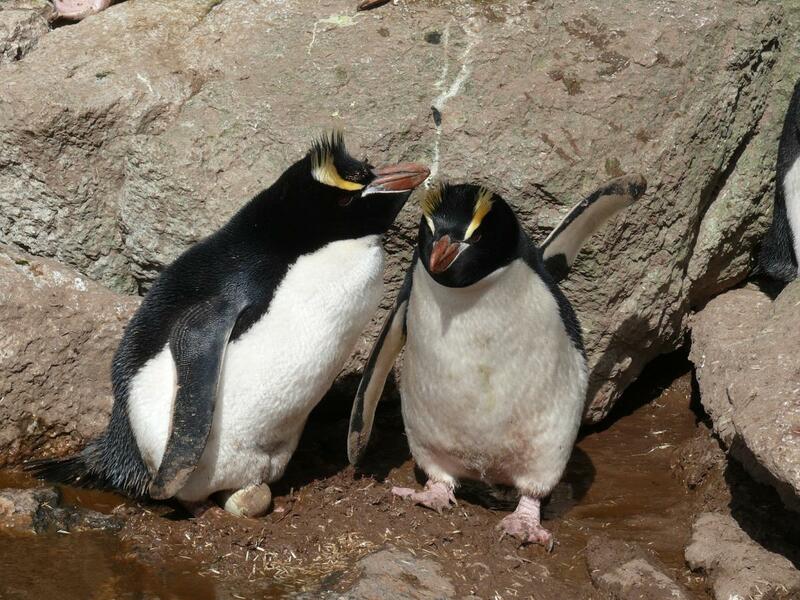 Erect-crested penguins have black backs, faces and throats, sharply demarcated from the white underparts. The large orange-brown bill has prominent pale blue-white skin around the base. Yellow eyebrow stripes start between the nostril and gape and rise obliquely over the red-brown eyes. From the front, the two crests are roughly parallel. Immature birds have smaller, darker bills and paler eyebrow stripes (almost white), and often have a pale chin. 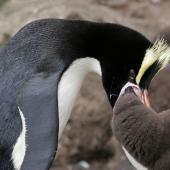 Voice: a booming bray, lower pitched than other crested penguins. 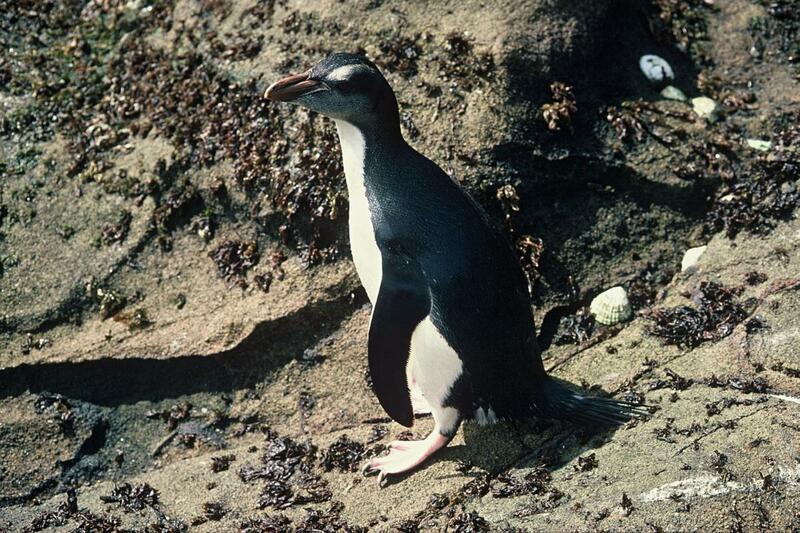 Similar species: the Snares crested penguin has a more swollen-looking orange bill when adult, and pinker skin around the base of the bill. 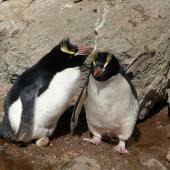 Snares crested penguins have crests starting nearer the nostril and passing back roughly in line with the bill. 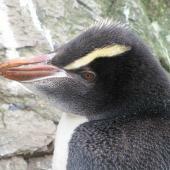 From the front, the crests of Snares crested penguins make a ‘V’, compared to the more parallel crests of the erect-crested penguin. 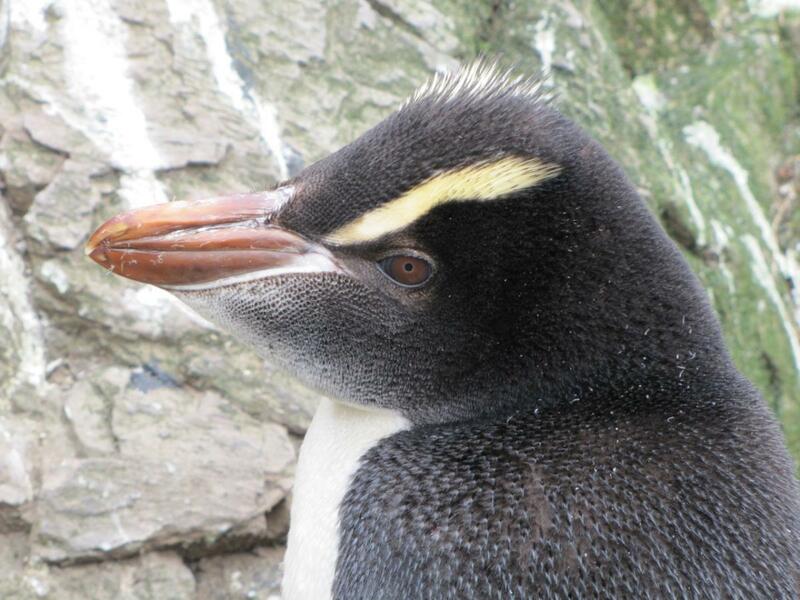 From the side, Snares crested penguins have a relatively small chin and a flatter crown. 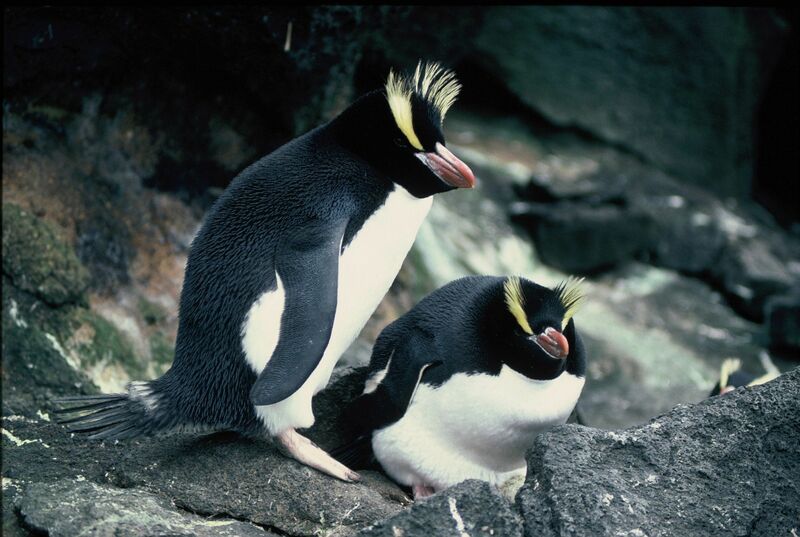 Erect-crested penguins only come to land to breed and moult. 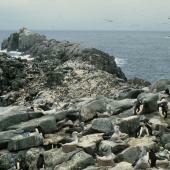 Almost all the birds breed on three islands in the Antipodes Island group and eight islands in the Bounty Islands. 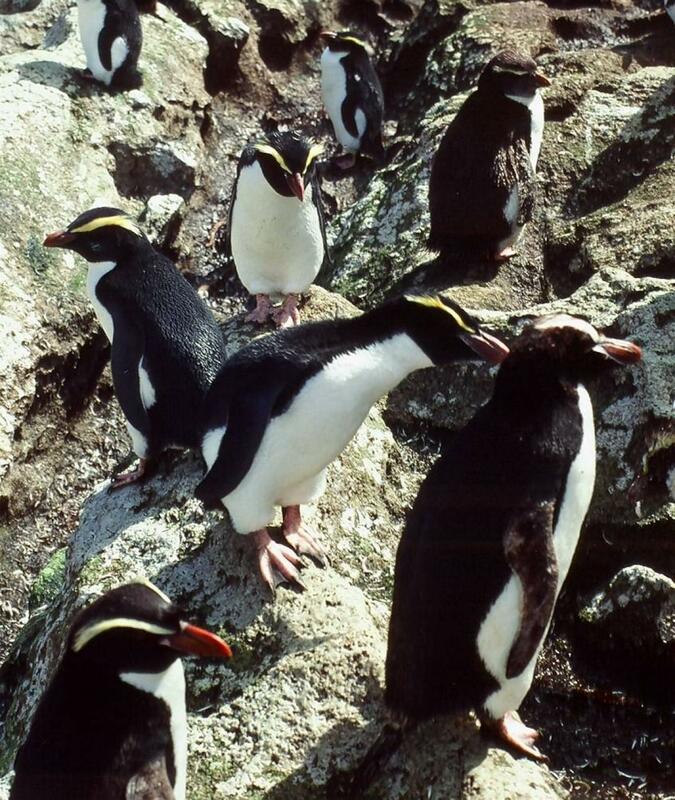 A few birds have laid on Campbell Island (1940s) and Disappointment Island, Auckland Island (1976), and a pair bred unsuccessfully on Otago Peninsula in 1938 and 1939, with the female continuing to visit and lay most years up to 1946. 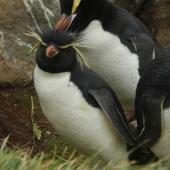 There are no recent breeding records away from the Antipodes and Bounty Islands. 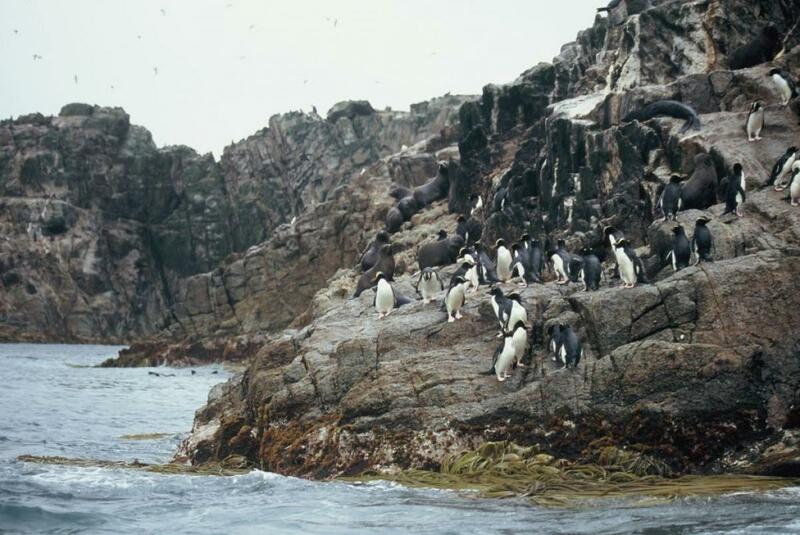 Colonies on Antipodes Island are on the rocky coastal margin. 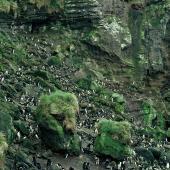 The Bounty Islands are almost completely devoid of vegetation, and the penguins nest anywhere they can reach that is not claimed by fur seals or Salvin’s mollymawks. 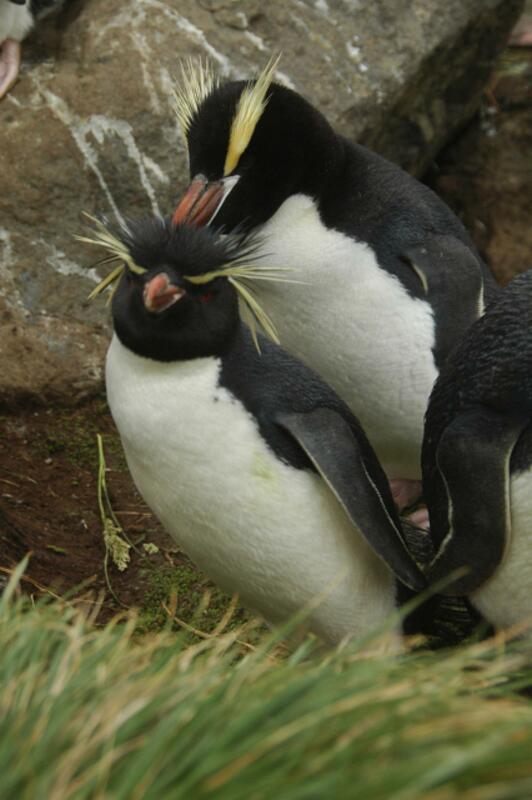 On Antipodes Island, eastern rockhopper penguins breed on the inland margins of erect-crested penguin colonies. 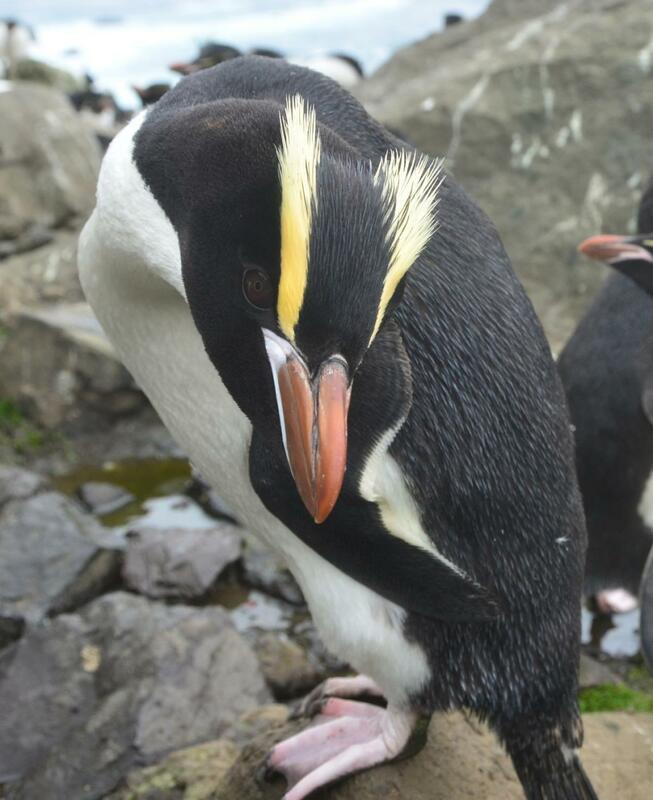 The larger erect-crested penguins are often seen among eastern rockhopper penguin colonies on the Auckland and Campbell Islands. 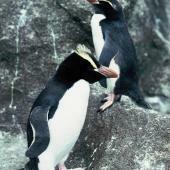 Erect-crested penguins are assumed to be pelagic during the non-breeding season. 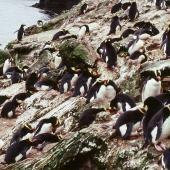 Vagrant birds, mainly moulting during January-February, are regularly recorded from the Snares Islands (up to 35 per annum), Chatham Islands (max 4), Auckland Islands, Campbell Island, Macquarie Island and the east coast of the South Island. 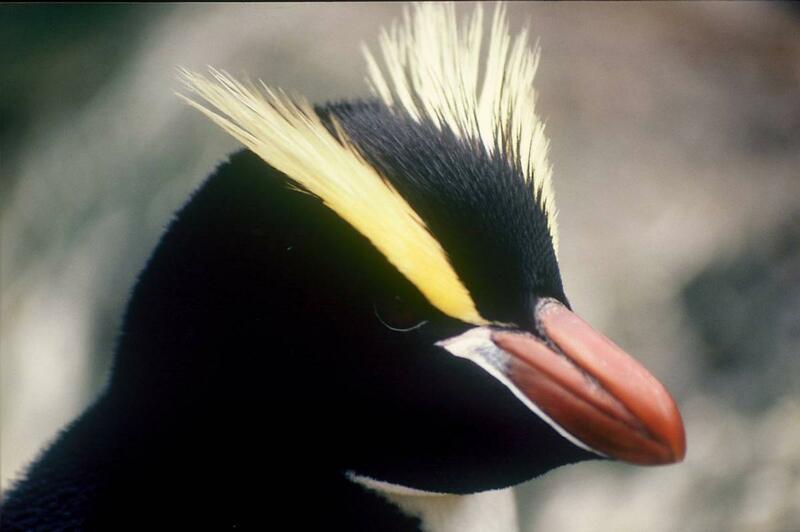 They are more rarely reported from Wellington, Wairarapa and Hawke’s Bay, and are extreme vagrants to Northland (New Zealand), southern coasts of Australia, Kerguelen Island and the Falkland Islands, where a bird formed a mixed pairing with a western rockhopper penguin. 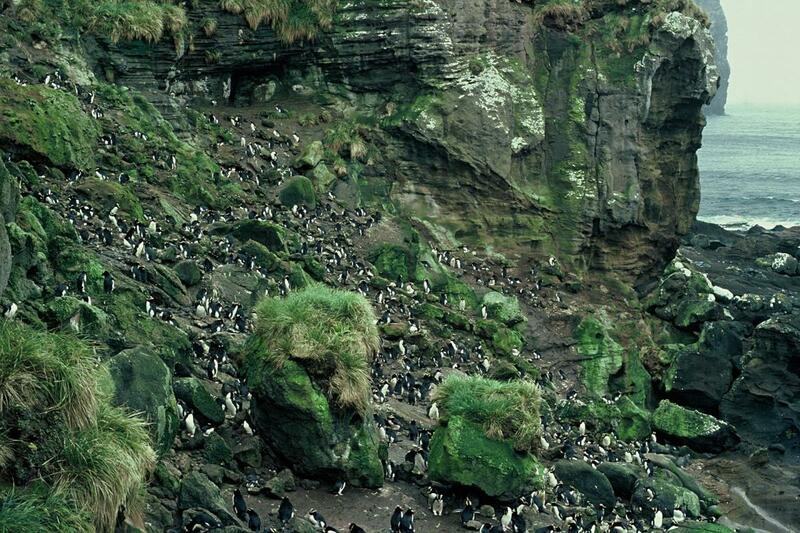 About 42,500 pairs breed on the Antipodes Islands (2011 estimate), and 26,000 pairs on the Bounty Islands, with a world population of about 68,500 pairs. 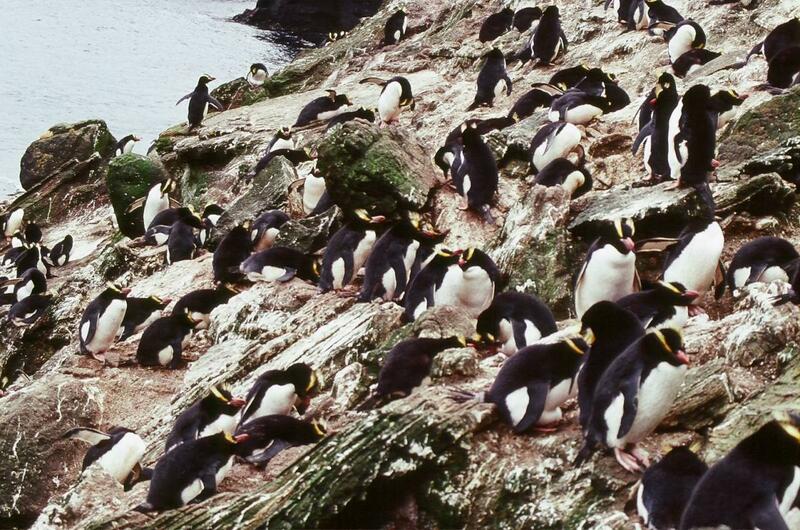 The breeding islands are free of introduced predators (mice on Antipodes Island are not considered a threat), and there are no recognised interactions with fisheries. However, historic photographs show that some Antipodes colonies are now much smaller. This probably reflects changes in local oceanographic productivity, requiring adults to swim further to find food for their chicks and thereby reducing breeding success. The conservation status of this species was changed from Naturally Uncommon to Declining in 2013. 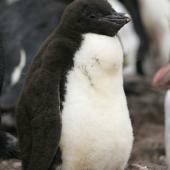 No single study has followed a full breeding season. 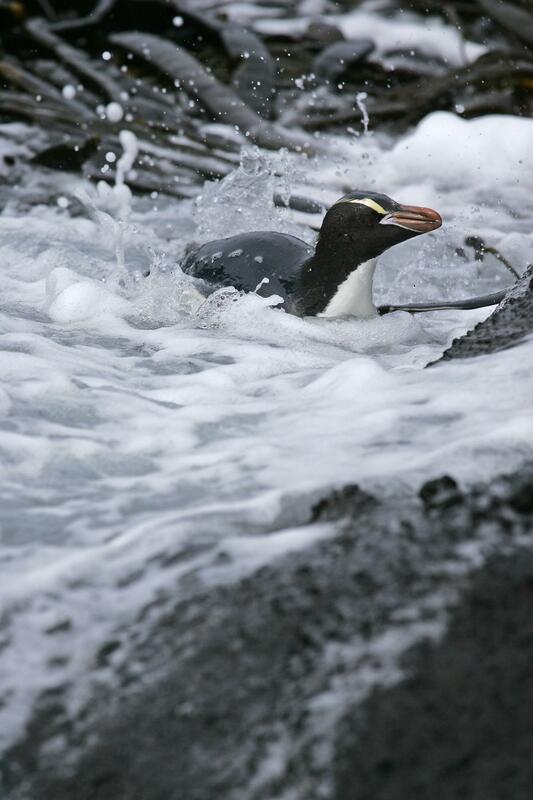 Adults return to breeding colonies on Antipodes Island in September and lay in early-mid October. 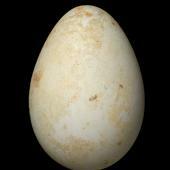 The second egg is 17-138% larger than the first (mean 81% larger), and is typically the only egg incubated full term. 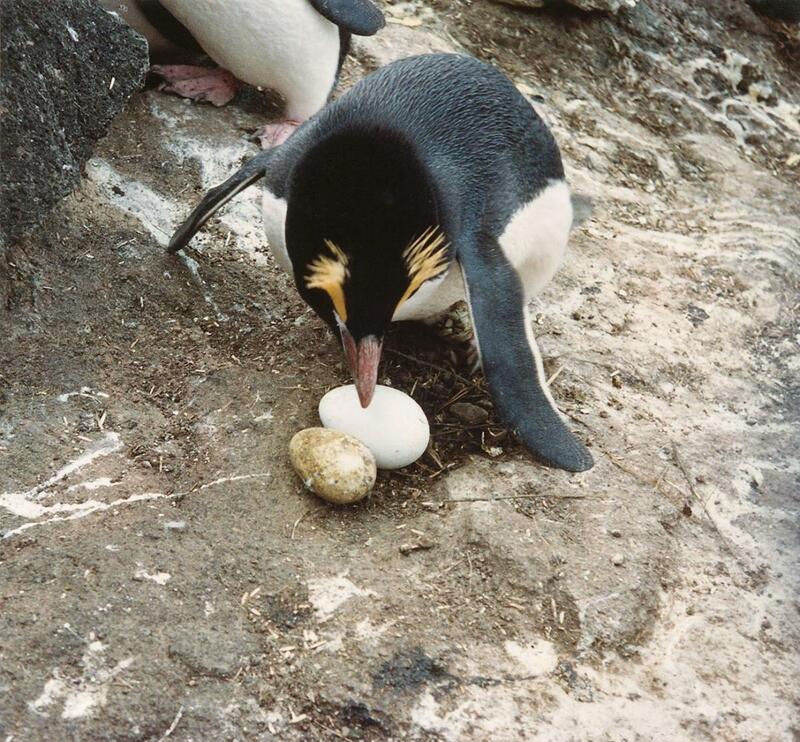 In relation to female bodyweight, the first egg is exceptionally small (2.8%) and the second egg is comparable in size to those of other crested penguins (5.1%). 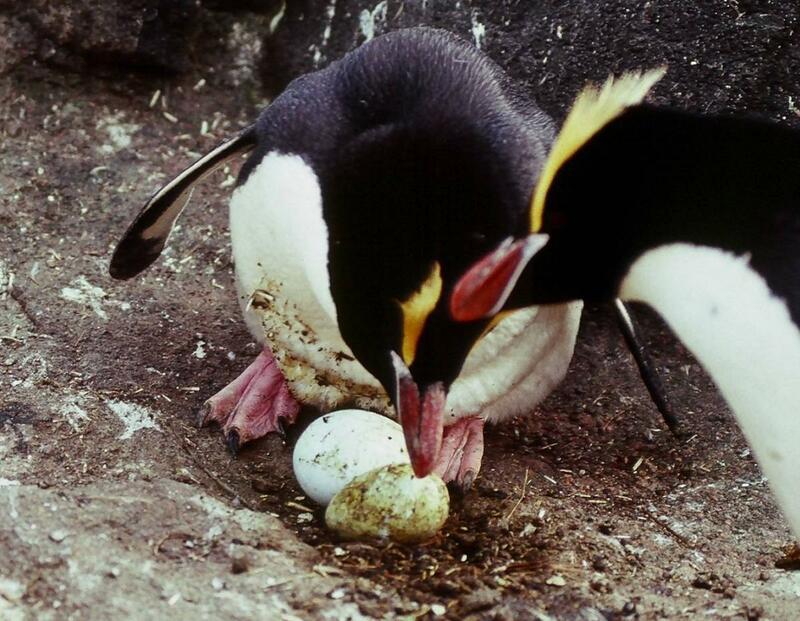 In a 1990 study, 97% of pairs had lost their first egg within 4 days of clutch completion, with 58% of pairs losing the smaller egg on the day the second egg was laid. Egg loss was witnessed on 13 occasions: 3 birds lifted the egg out of the nest bowl with their beaks, 3 stabbed or pushed it out, 6 birds lost eggs while rearranging the eggs by shuffling the body and feet, and 1 while rearranging eggs with a closed beak. Birds attempting to incubate 2 eggs were much more restless than those that had already reduced their clutch to a single egg. Egg loss was not associated with aggression. A similar study in 1998 failed to observe deliberate egg rejection, and considered egg loss to be a consequence of the mechanical difficulties associated with trying to incubate two such disparate-sized eggs. 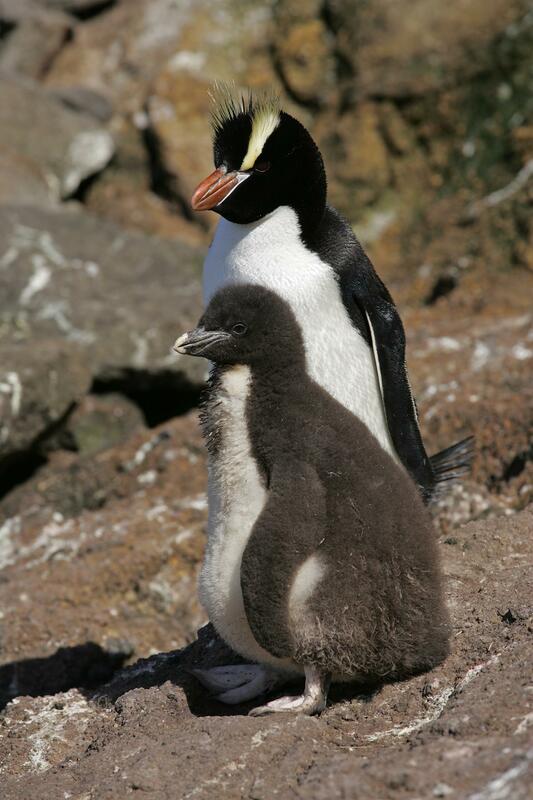 Both adults share incubation and care of the young. Eggs hatch in mid November. 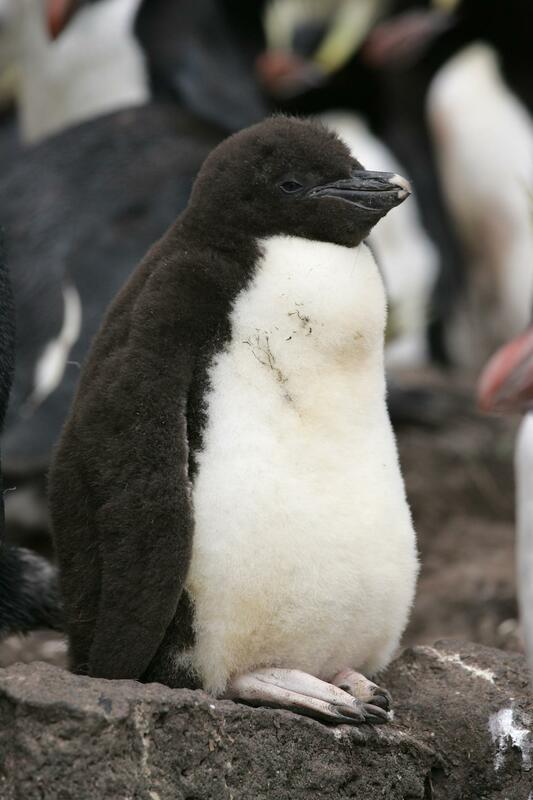 Chicks are guarded for c.3 weeks, then form crèches for about 6 weeks before departing the island in late January and early February (peak 30 January). 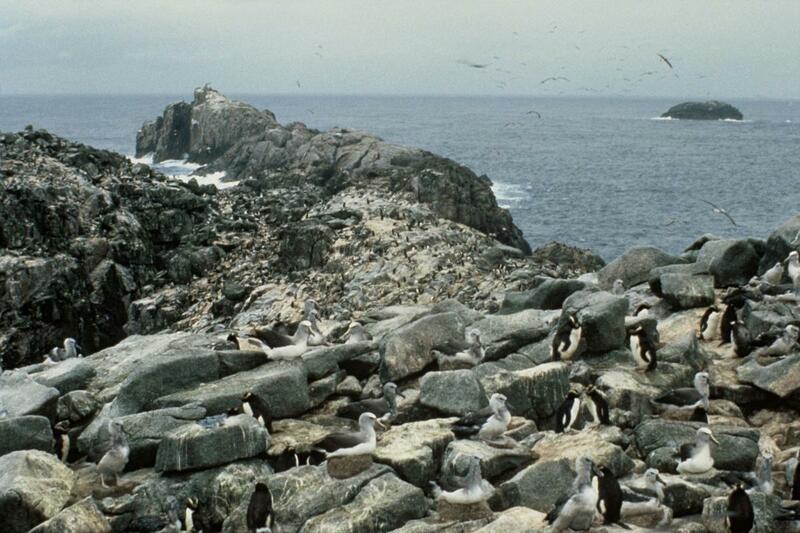 The breeding season on the Bounty Island was reported to be 2-3 weeks later than on the Antipodes in 1978, but similar to the Antipodes Island schedule in 2012. 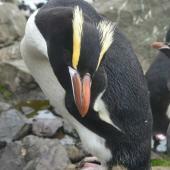 Erect-crested penguins are colonial breeders, and typically forage in small flocks when close to their breeding islands. 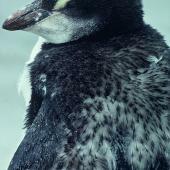 Their distribution at sea is poorly known, but is likely to be mainly south-east of New Zealand and north to the Chatham Islands. Adults moult at breeding colonies in late February through to early April. Non-breeders (mainly young birds) moult among the breeding colonies in February through to early March. 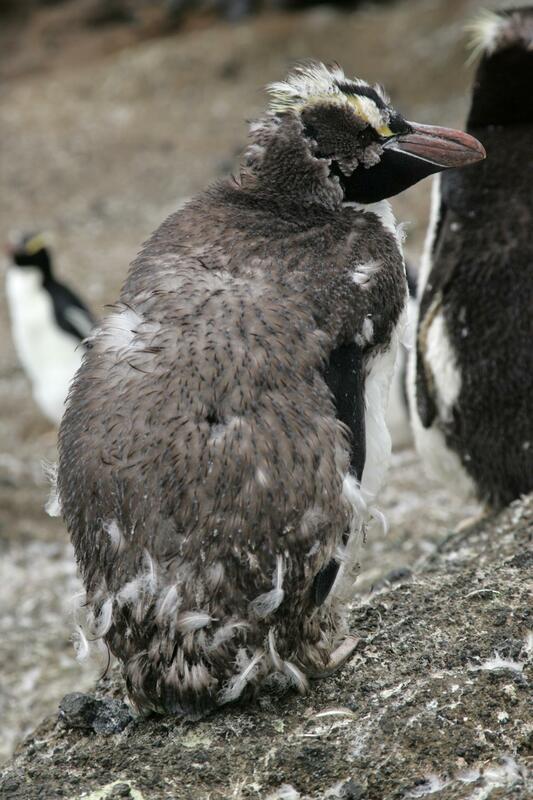 Each bird stays ashore for the 26-30 days required to complete moult. 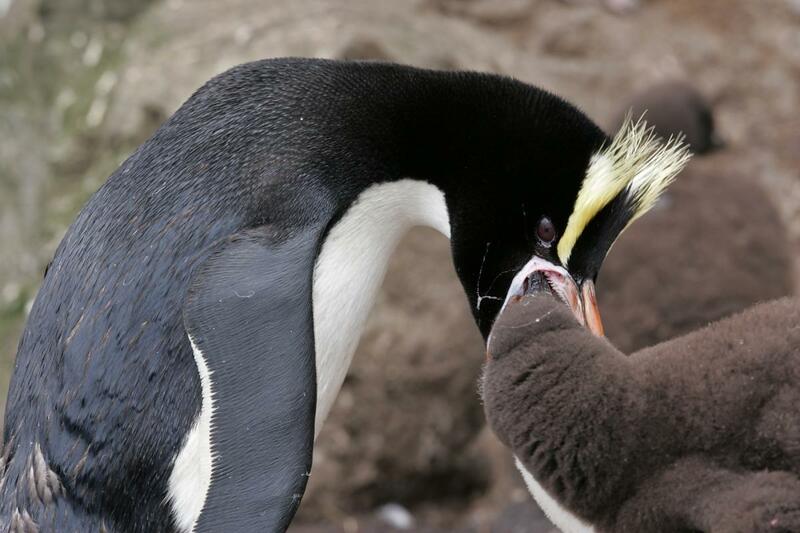 Erect-crested penguins catch and eat small crustaceans and squid. Davis, L.S. 2001. A superlative penguin. Natural History 110: 46-55. Davis, L.S. ; Renner, M. 2003. Penguins. New Haven & London, Yale University Press. Miskelly, C.M. ; Carey, P.W. 1990. 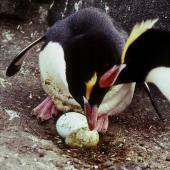 Egg-laying and egg-loss by erect-crested penguins. Pp 2-11 in Miskelly, C.M. ; Carey, P.W. ; Pollard, S.D. 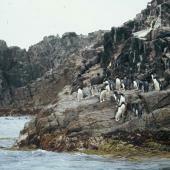 Antipodes Island expedition 12-16 October 1990 report. Christchurch, University of Canterbury. Richdale, L.E. 1941. 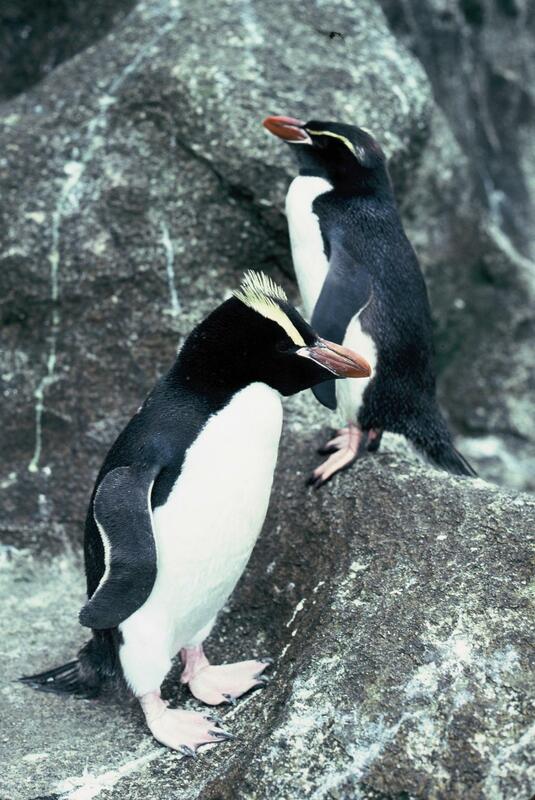 The erect-crested penguin (Eudyptes sclateri) Buller. Emu 41: 25-53. Richdale, L.E. 1950. 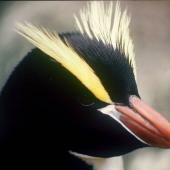 Further notes on the erect-crested penguin. Emu 49: 153-166. Robertson, H.A. ; Dowding, J.E. ; Elliott, G.P. ; Hitchmough, R.A.; Miskelly, C.M. ; O’Donnell, C.F.J. ; Powlesland, R.G. ; Sagar, P.M.; Scofield, R.P. ; Taylor, G.A. 2013. Conservation status of New Zealand birds, 2012. NZ Threat Classification Series 4. Department of Conservation. Wellington. Warham, J. 1972. 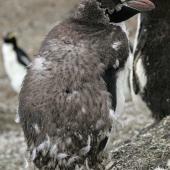 Aspects of the biology of the erect-crested penguin. Ardea 60: 145-184. Shallow muddy scrape lined with stones or bones. Chalky white, with pale blue tinge when fresh. Rapidly soiled with mud. 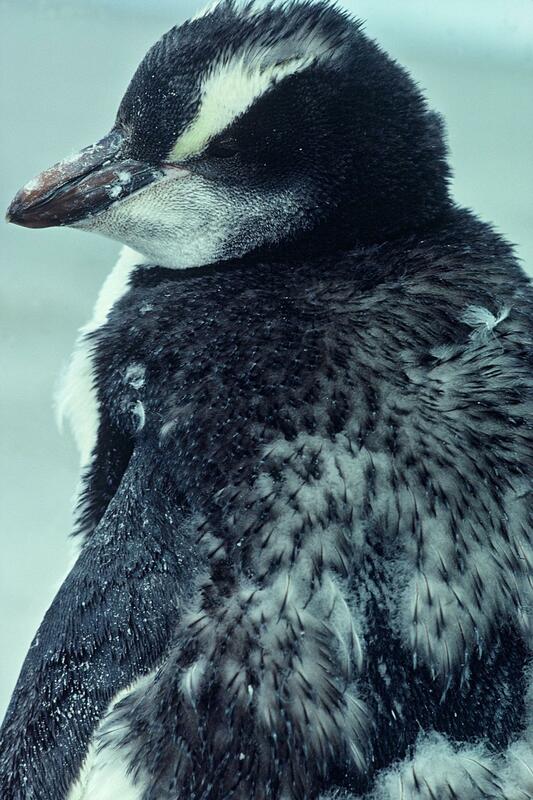 A medium-large crested penguin with a black back, face and throat, sharply demarcated from white underparts. 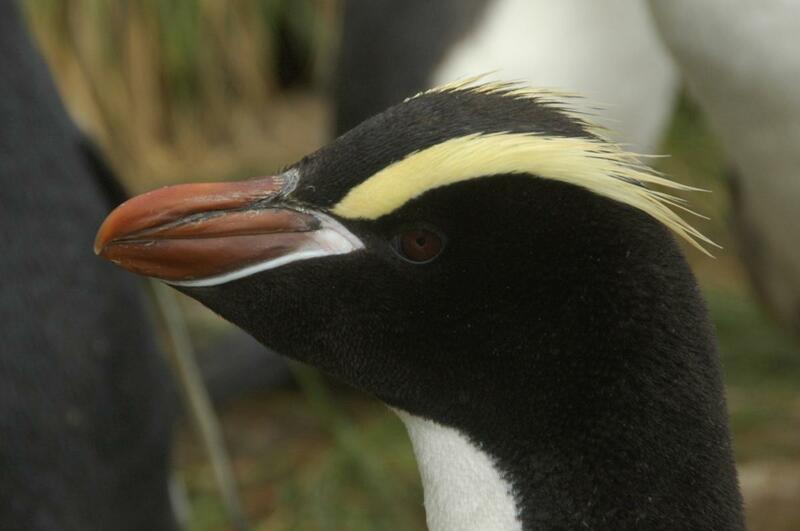 Yellow eyebrow stripes start between the nostril and gape, rising obliquely over the red-brown eyes, and the large orange-brown bill has prominent pale blue-white skin around the base.